There is no “balance in the Force” without the #Jedi. Great to see #MaxVonSydow. Without the Jedi, the scales have tipped to the Dark Side. Looks like the galaxy needs a new hope. Von Sydow’s inclusion in the cast continues Star Wars’ long tradition of tapping classic Hollywood actors to play key parts: Sir Alec Guinness and Peter Cushing in the original trilogy, Christopher Lee in the prequels. The trooper with three blood marks has trouble following orders. I can feel the conflict in him. These markings remind me of the various symbols and designs on clone trooper helmets in The Clone Wars TV series and the muddy handprint on the faces of Saruman’s orcs in Peter Jackson’s The Lord of the Rings trilogy. Bread in seconds. #Rey can really hydrate a loaf. Reference the instant pizzas in Back to the Future Part II (1989). “The droid’s not for sale.” I’ve heard that before somewhere. A reverse of Obi Wan’s statement in A New Hope (1977). The #TIE crash lands on #Jakku. Don’t worry, the scrap will be used to help feed someone. There’s a later scene where scavengers run straight toward a TIE fighter right before it crashes into the sand. When your livelihood is based on bartering machine parts, you get it while it’s hot, I suppose. “I am with the Resistance.” Ha! A funny scene that reveals Finn’s ability to improvise in order to survive. “The garbage will do.” Hey, she’s still a fast hunk of junk. “Anything else?” #KyloRen needs some anger management. At least he doesn’t kill his officers like Vader. #BB8’s thumbs up is uproariously funny. The droid reveals its true purpose as a mobile cigarette lighter. “Yes I do. Every time.” Han has always been a #SmoothTalker. Han might make a mess in a cantina or step on a gangster’s tail, but he can always talk himself out of trouble. Remember “Shut him up or shut him down” from The Empire Strikes Back (1980)? “It’s all true.” #HanSolo is now a believer in the #Force. He’s come a long way from his “simple tricks and nonsense” days. “Women always find out the truth.” The wisest thing #HanSolo ever said. And judging by his frosty relationship with Leah, it looks like he learned this truism the hard way. This is her “cave” scene (a la Luke in Empire). It’s hard to conceive of a weapon on a more epic scale than the #PlanetKiller. Jaw dropping. #HanSolo using #Chewbacca’s crossbow is a hoot. Nitpick alert: You mean to tell me that in all of their adventures together, Han never tried out Chewie’s crossbow? When a prissy droid thinks you’re high maintenance, you’ve got some issues. Clearly Ren needs some tips from Spock on how to extract information from someone’s brain. A funny scene and a trivia question all wrapped into one…the actor inside the trooper suit is none other than James Bond himself, Daniel Craig. The string of one-liners in this movie is also reminiscent of the humor in Hope. “Escape now, hug later.” Always good advice. Consider this: if Rey and Finn hadn’t hugged, Han might’ve had a few more seconds to take the lightsaber out of Ren’s hand. That hug killed Han! A passing of the baton, er, lightsaber between initiate and master. The opening shot of the dark side of a #StarDestroyer is brilliantly visualized. This shot sets the tone for the entire movie…it’s compositionally similar to many of the opening scenes in the earlier films, but is shot in a unique style with a completely different mood. It’s a symbolic change that’s emblematic of the movie’s many variations on the theme. The frozen blaster beam is tight. A really striking visual that also illustrates Ren’s formidable powers. The “lived in” universe, i.e. crashed #StarDestroyers, #ATATs, etc, is startlingly realized. These scenes have a strong sense of place and really capture the look and feel of Hope. There’s a lot of atmosphere and magic here. R2 was pretty important in his day too. “They’ll be pieces of us in three different systems.” Ha! “Whatever you do, don’t stare.” Hard not to in that eclectic gin joint. Isn’t that like trying to ignore the elephant in the room? Finn takes Han’s advice and fesses up to Rey. It’s got quite a kick. This line is precipitated by an incredible, writhing long take that showcases Dameron’s fancy flying. It’s nice to know that some things never change. In the Roman Empire, if a prisoner escaped under your watch your life would be forfeit. “Is there a garbage chute? Trash compactor?” Han would know. Although I wouldn’t be so cavalier in Finn’s place. Riling Ren isn’t a good idea…unless you’re a Jedi. A mechanical meet cute where old meets new. A nice moment. #Rey finds #LukeSkywalker. #MagicalMoment. #ChillBumps. The scene reminds me of old martial arts movie where an initiate would have to scale a tall mountain in order to begin the training process with a Kung Fu master. A similar scene in Krull (1983) comes to mind. Also, Luke’s destiny seems to be the last hope for the Jedi order…he’s had that distinction twice now. Final analysis: a bold new look for the franchise with a plot that mirrors #ANewHope. And a large helping of Empire too. Rating: 3 out of 4. Better than the prequels but still lacks the magic of the original trilogy. A long time ago in a galaxy far, far away…there were three good to amazing movies (Episodes 4-6) and three fair to awful films (Episodes 1-3) from creator, director, writer George Lucas. Now, after a fallow decade for the franchise, after Lucas passed the baton to Star Trek director J.J. Abrams and after Lucasfilm was sold to Disney, Episode VII, known as Star Wars: The Force Awakens, has finally been released amid much anticipation and under a cloud of secrecy that could shroud Bespin. To bottom line it for you, Awakens is worthy of all the hype. While Abrams’ riff on Lucas’ space epic lacks the wide-eyed wonder and sheer exhilaration of the original trilogy, it’s a Kessel Run ahead of the prequel trilogy. In addition to moving the series forward chronologically (thirty-two years to be precise), Abrams has also made the series more palatable for contemporary audiences, just like he did for the most recent Star Trek movies. Updating the technology, like various space ships and droids (i.e., the sleek ball-like robot BB-8), was a no-brainer. However, an even more important step in modernizing the franchise was Abrams’ sage decision to showcase more diversity in the cast, something that was largely missing from the earlier six Star Wars films (and that Lucas was widely criticized for). The two new heroes are a woman (Rey) and a black man (Finn). (Side comment: I’m really surprised there hasn’t been a racial uproar over the obvious similarity between the latter’s race and name to Huckleberry Finn). London actress Daisy Ridley, in her big screen debut, plays salvage scavenger Rey. Rey is a distant of echo of Luke Skywalker (Mark Hamill) since her desert home world, Jakku, is a dead ringer for Luke’s Tatooine…with the notable exception being that her planet is littered with derelict Star Destroyers and AT-AT walkers, not Krayt dragon skeletons. Lucas’ conception of a “lived in” universe is vividly realized in Abrams’ first foray into the Star Wars saga. The scenes involving Rey inside and outside the junked Star Destroyer are truly jaw-dropping (especially in 3D). All of the desert scenes (shot in Abu Dhabi), particularly the scene where Rey slides down the sandy slope, are rich in atmosphere and tap into the gritty, organic feel that made A New Hope (1977) so otherworldly and magical. One of the desert scenes depicts the crash landing of a TIE fighter with two of our heroes aboard: Finn (John Boyega), former stormtrooper turned Resistance fighter, and Poe Dameron (Oscar Isaac), ace pilot for the Resistance. Isaac (Ex Machina) has a scene with big screen legend Max Von Sydow, who makes a short, yet powerful, cameo at the beginning of the film. Just as in Hope, the villain is introduced within the first five minutes of the film. Even though Darth Vader has been replaced by Kylo Ren (Adam Driver) in this film, there is a rather important connection between the two antagonists which is the basis for one of the movie’s many mysteries. Of course, the two biggest enigmas in the movie are Luke’s location and Ren’s true identity—both characters are on opposite ends of the Force spectrum and, as destiny and Hollywood writing would demand, have had dealings with each other in the past. Despite various side stories and numerous action sequences, the whereabouts of the former Jedi master is the movie’s central through line. Normally a movie’s MacGuffin is an object or thing, but in this case it’s a person…Luke. 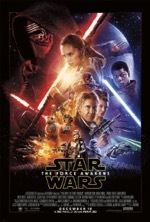 And just as Luke is scarce in the movie, he’s nowhere to be seen on the movie poster, which has generated a great deal of controversy and speculation. Wild theories abound including one that has Luke inhabiting the dark outfit of the movie’s main villain, Ren. As for Ren, Abrams made the wise choice to not make him too much like Vader. Admittedly, the black outfit and wheezy mask are similar, but the comparisons between the two villains diverge from there. Vader takes out his aggressions on his subordinates while Ren manages his anger by shredding computer terminals with his three bladed lightsaber. Vader’s voice is deep and heavy on the reverb, while Ren’s vocalizations are thin and tinny, like a poor radio transmission. The most significant difference is that Vader is a Sith and Ren isn’t—so avers Abrams. As such, I don’t think there’s any doubt that Vader, the Master, could kick Ren’s Learner heinie. One of Ren’s character snafus is that, barring severe allergies, he doesn’t really need a mask. Sure, it gives his character added mystique and explains some of his back story, but it’s an utterly superfluous plot element. The scene where Ren removes his mask isn’t even half as momentous as when Vader does the same in the original trilogy. Three mo-cap characters that are worthy of mention are: Maz Kanata (Lupita Nyong’o), Unkar Plutt (Simon Pegg) and Supreme Leader Snoke (Andy Serkis). Abrams has created photo-real CG creatures without making them too cutesy like Lucas’ alien creations in the prequels…thank the Maker. Of course, I’d be remiss if I didn’t mention the most important characters in the film—the entire cast of the first trilogy: Han Solo (Harrison Ford), Skywalker (Hamill), General Leia Organa (Carrie Fisher), Chewbacca (Peter Mayhew), C-3PO (Anthony Daniels) and R2-D2 (Kenny Baker). It was uber-clever of Abrams to bridge the generations by integrating the original cast into this film. Ford, in particular, seemed to be having a ball this time around and turns in some of his finest acting in years. Han’s opening line, “Chewie, we’re home” is cheer-worthy and makes for a memorable appearance for the smuggler and his rangy sidekick. In fact, each of the characters, including the droids, is given a dramatic entrance in the film (however, the reason why C-3PO has a red left arm is never explained). It would’ve been standard, lazy Hollywood storytelling to just have the original characters show up, deliver a few lines and serve as nostalgia fodder for adult audience members. Fortunately, Abrams, along with fellow scriptwriters Lawrence Kasdan and Michael Arndt, wove these classic characters into the tapestry of the film in intelligent and delightful ways and gave each of them a significant role to play in the story. Despite their heavy action and occasional frightening images, the Star Wars films have always been family friendly (and, fittingly, have focused on a family of characters), and Awakens certainly continues that tradition, as would be expected with Disney serving as owner and distributor of the film. However, that doesn’t mean this movie is tame…nothing could be further from the truth as the film has plenty of pulse-pounding action. The film also boasts a degree of creative vision that’s nearly unparalleled in cinema history. Even story elements that are completely unfounded scientifically, like the splintering death ray emanating from the Planet Killer, are mind-blowing in their scope, power and execution. Abrams’ greatest contribution to the film was his Force-like ability to locate and populate the unexplored spaces within the extant Star Wars panoply. It’s almost as if Abrams and his writers listed dozens of things never attempted in the franchise and then selected a handful of them to build a plot around. The opening minutes are proof positive of this supposition since we’ve never seen the dark side (symbolic, right?) of a Star Destroyer before, nor a major ground assault at night. Most significantly, there isn’t a single space battle in the entire movie…all of the ship confrontations are staged as aerial assaults on a planet’s surface. The movie also marks the first time that enemy forces have conducted a tactical retreat…something that never would’ve happened on Vader’s watch. It’s possible to analyze this movie until the Banthas come home, but suffice it to say, this film has remained faithful to Lucas’ vision while venturing out into some bold new territory with some incredible new characters. Sure there are plot holes, inconsistencies and nitpicks here, as there are in any movie, but Awakens is a very serious attempt at doing justice to Lucas’ brainchild. Most of the early criticism of the film has centered on the story, which is ostensibly a patchwork reworking of the themes, scenes and lines from the original trilogy, particularly Hope and Empire. But the way I see it, if you’re going to borrow, why not borrow from the best? Whether you appreciate this kind of rehashed, retro-cool plot or not, I’m sure you’ll agree that this film has far, far surpassed the mediocre efforts of Episodes I-III—and how ironic that the characters in the movie are coming out of a Dark Ages (with no Jedi to ward off scum and villainy) just as we in the audience are coming out of one of our own (the prequels). Abrams’ film has resurrected the long dormant, long lackluster franchise with visual panache, an engaging story and some truly unforgettable moments. It has also effectively introduced the series to a whole new generation of fans. Once again, the Force is strong in the Star Wars universe.